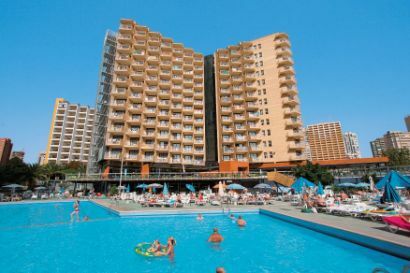 Refurbished in 2005, the large, active and lively Medplaya Rio Park Hotel is a firm favourite with British guests. Staff and guests alike take part in evening entertainment and there's a good atmosphere in the British pub. Especially popular with families, all age groups visit and enjoy the friendly welcome at the Rio Park - if they're not looking for a quiet holiday! If your looking for a cost effective hotel in Benidorm, then look no further than the Hotel Rio Park from MedPlaya Hotels. "Central To Everything In Benidorm"
There were three of us on this holiday and the hotel was everything you could want. The staff were very helpful and couldn't be more friendly. The hotel has been recently refurbished to a very good standard and there were various areas to relax or join in with all of the entertainment the hotel offered. We would return to this hotel in the future and would look forward to doing so. The prices of food and drinks were reasonable, giving a good selection. The hotel is central to everything in Benidorm. "Give Rio Park A Go & You Will Go Back"
The best thing about this hotel is that if your a baby or an o.a.p you will love it. The pool is brill we tended to stop there all the time. We have 2 little ones at 4 and 1 and they loved it in the park which is just at the side of the pool. This year will be our 3rd time at Rio park the staff aren't there just to wait on you they also become your friends. There is a wide range of variety on the menus which is great for the younger ones and if your not a fan of Spanish food. The waiters are fab they are really friendly and make you feel welcome which is a great way to help you relax and enjoy your holiday even more. The rooms are very clean and air conditioned which we thought was ideal. The rooms were really spacious which is handy if you have lively kids which like to run about. If you get a chance we would recommend the Terra Natura which is just fantastic we loved every minute of it. There is animals of every kinds from tigers and elephants to parrots and mice. When you have looked at the animals there is a water park which is fantastic. The nite life is good too, from clowns in pubs for kids to clubs for older ones. Our overall view is that it is great so if you are reading this just give Rio Park a go and you will go back again year after year. "Staff Could Have Been More Friendly"
Just had two weeks here and the food and hotel was excellent, would go back and most probably will do. Entertainment not very good and staff could have been more friendly, overall an excellent holiday and now need to go on a diet ! Food had so most choice and all meals I had were excellent. Well the best thing was the long sandy beach really close to our hotel where we lazed about for hours. The weather could not have been better and we went to the beach almost every day. The nightlife was fab as well as the bars, discos and restaurants just minutes away from our hotel. Drinks and food were cheaper than here, and there were special offers on drinks so we were never out of pocket. One evening we went to a show at the Benidorm Palace. It was good if you like that kind of thing but I found it too long. Glad we had eaten before as the dinner there did not look very appetising. We also enjoyed window shopping in the old town after which we stopped for a cold pint at a cosy pub. If you have kids there is a theme park called Terramitica which our friends' kids enjoyed a lot and also a safari park. Watersports was also on offer but we preferred to be lazy during the day. However we went for a boat trip to Peacock Island. The scenery was lovely and although it was quite hot for hiking we went for a walk round the island followed by very cold coke in the bar which we surely merited. There were other boat trips available too. This is a real family hotel which caters for all ages from babies to OAP's. Most of the people around the pool will tell you they have been before and keep coming back year after year. The hotel is clean and comfortable but basic, hopefully this summer 2005 the rooms will have air conditioning after a much needed refurbishment. It is the staff that make this hotel they go out of their way to make sure you have a great holiday. Jose the manager puts on staff shows most nights to entertain the holidaymakers and these must not be missed!!! The hotel is on a slight incline up from the beach but is still suitable for those with walking difficulties - just take the pace a little slower. Give the Rio Park a try I know you will love it. "Staff Provide The Evening Entertainment"
Big, not fancy, hotel with plenty of space. Rooms are good sized with the usual features and are clean. Can be noisy if you have inconsiderate neighbours though staff will help. I have used this hotel for 20+ years and always come back because the staff make it their business to look after you, I regard many as friends. Food in the dining room is aimed at the family and is mainly British in style. There is always something on the buffet for me. Bars in the hotel are efficient with reasonable prices and friendly staff. Staff provide evening entertainment for those who don't want to go out and sample Benidorm's nightlife, The manager Jose genuinely cares about his customers and will always help any way he can. Not a place for a quiet break or for the snob but the place for family holidays, there's lots for the kids in the hotel and plenty around about. Near enough the centre but not so near as to suffer from the street noise etc. "Staff Are All Polite And Very Helpful"
I think the hotel looks even better than last year with the new reception area. The bars and the decking all around offer a lot more choice to sit and relax. The shows that Jose and his staff are great, they had me splitting my sides! The staff are all polite and very helpful at all time of day and night, The Thomson reps are good and polite too especially Kidszone they was fantastic being as it was just me and my daughter she loved every minute. We will go back to the Rio Park in years to come. The area is good as you are close to the shops and not that far from the beach too, so thank you for a great holiday see you all soon!